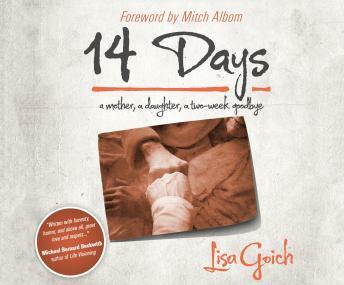 When Lisa traveled home to visit her parents in December 2011, she never expected an ordinary three-day weekend to turn into an extraordinary 14-day observance of her mother's life - and ultimately - death. 14 Days is a story of parental loss, and how to lovingly, bravely and gracefully let go of a hand you've been holding your entire life. From a child's first breath to a mother's last, this memoir shows how closing that circle can be a celebration of this unbreakable bond.